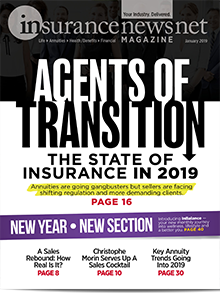 AT 44, disenchanted with his job and realizing his 5-year-old daughter needed him more and more, Anthony Arroyo became an insurance agent last summer. The San Antonio man spent many years studying the giants of insurance, including the legendary Ben Feldman. Still, Arroyo had not planned to leave his thriving career as a relationship officer at a credit union. But the job had become more of a business and less of the simpatico relationship Feldman describes in his books, Arroyo said. Arroyo is one of many new agents lured by the promise and opportunity in the insurance field. More than 4 million baby boomers are retiring annually, while estimates put the insurance industry as needing roughly 400,000 advisors by 2020. The industry they enter is changing dramatically. Technological innovations are creating consumers with new expectations. 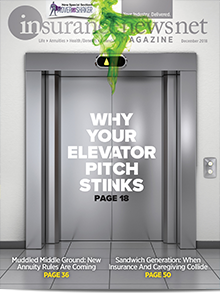 Likewise, regulation is leading to new products and new compensation practices. Annuity rebound. 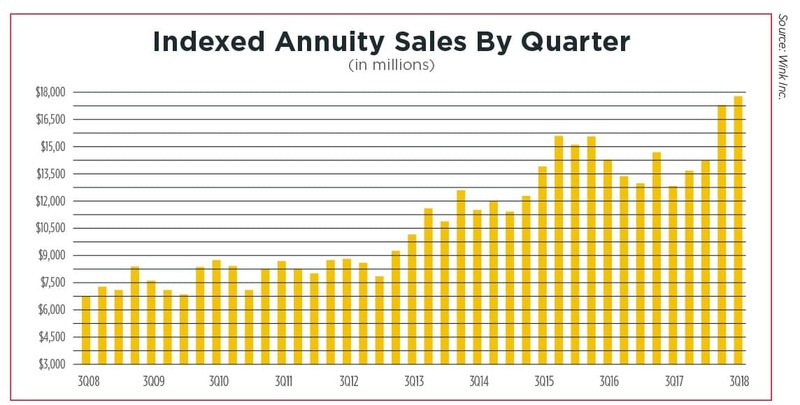 Annuity sales skyrocketed in the third quarter and are expected to continue upward. The looming threat of regulation, as well as a sudden economic downturn, could change that, however. Tougher rules. New regulations are on the table and on the books. While state insurance commissioners and the Securities and Exchange Commission work to finalize best-interest proposals, states such as New York have their own rules ready to go live in 2019. Holistic planning. 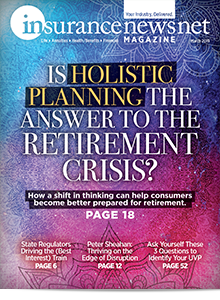 All signs point to advisors steadily taking on a bigger role to guide clients into retirement. That can mean factoring in tax planning, health care and longevity — most likely, all three. Arroyo is just getting started working his leads with Curiman Brokers Group in San Antonio. While he is still selling financial products to customers with many of the same goals as those at the bank, Arroyo is in a different world now. Arroyo, who is also a musician and recording engineer, began his financial services’ career with Security Services Credit Union in 1997. Over the years, he established friendships with many customers who needed checking accounts, certificates of deposit or other products. Unbeknown to Arroyo, a couple of his customers knew one another and recommended him for an agent opening at Curiman, a Houston-based agency. “It was time” to make the move, he said. Although he has been licensed for only a few months, Arroyo said he is committed to the principles outlined by Feldman, who he considers a mentor. Like all new agents, Arroyo needs to build a book of business. A Hispanic man married to a Vietnamese woman, he has a foot in two cultures that are traditionally underserved by the insurance industry. Arroyo reported 300 leads during an early December interview. Still, many in those minority communities remain naturally skeptical. Although he is starting with life insurance, Arroyo wants to join the trend toward holistic advising. That means learning the tax code, adding general planning expertise and, eventually, getting a Series 6 securities license. One product line Arroyo is excited about is annuities. 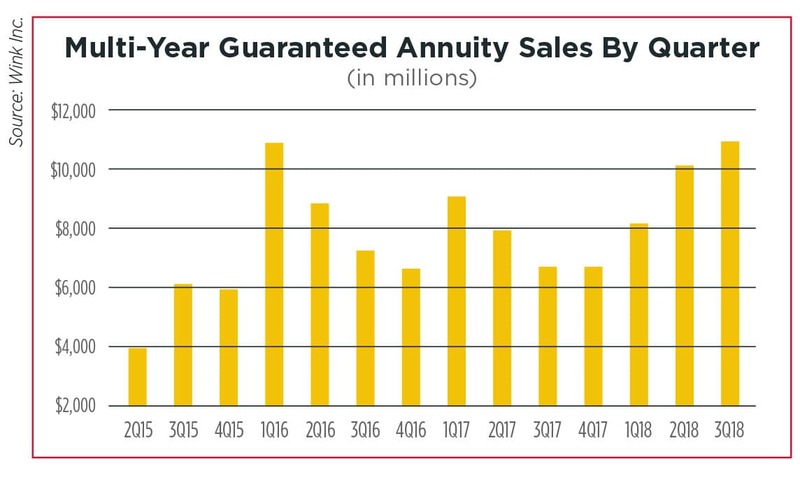 After a few up-and-down years, annuity sales rebounded strongly as 2018 came to a close, a trend that analysts expect will continue into 2019. 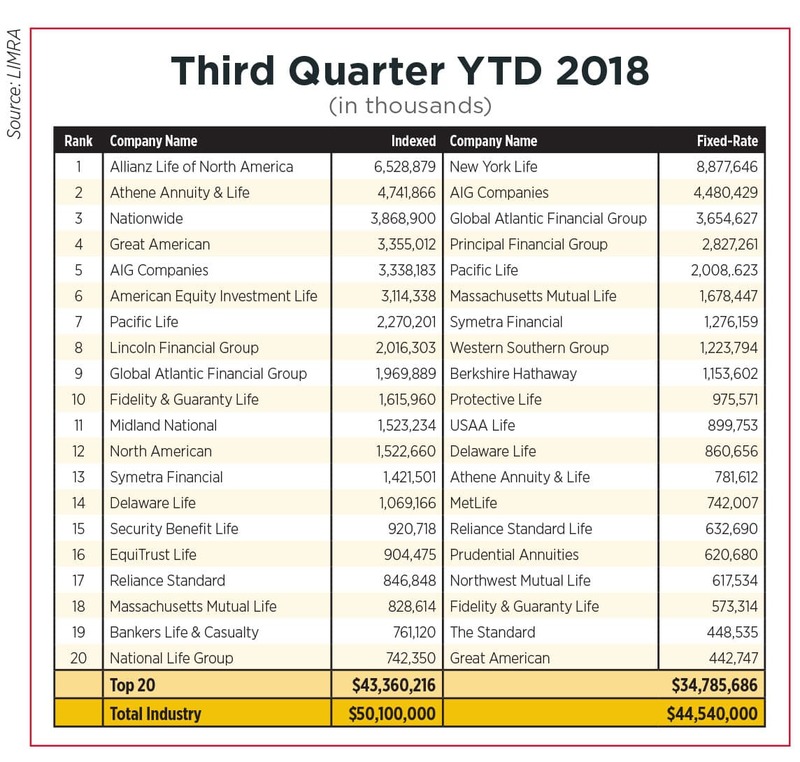 Third-quarter, non-variable, deferred annuity sales were $29.6 billion; up nearly 5 percent from the second quarter and an astounding 46.2 percent jump from the third-quarter 2017, according to Wink’s Sales & Market Report. Non-variable, deferred annuities include the indexed annuity, traditional fixed annuity and multi-year guaranteed annuity product lines. Fixed indexed annuity sales were $18 billion in the third quarter, LIMRA reported, 38 percent higher than third quarter 2017. FIA sales were $50.1 billion for the first three quarters of 2018, 22 percent higher than a year earlier. The overall strength of the annuity market is the result of many factors, analysts agreed. Rising interest rates for one, said Todd Giesing, annuity research director at the LIMRA Secure Retirement Institute. Year-over-year variable annuity sales increased 25 percent in the third quarter. In the first nine months of 2018, VA sales were $75.4 billion, up 4 percent compared to 2017. RILA sales were $7.68 billion through three quarters, 13 percent higher than 2017. Finally, overall annuity sales were $58.8 billion, 25 percent above third-quarter 2017 results. 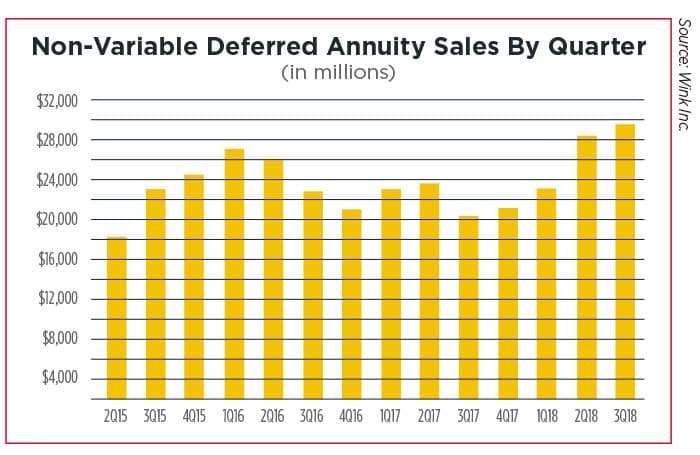 For the first three quarters of 2018, total annuity sales were $170 billion, which is 11 percent higher than the prior year. April 2019 will mark four years since the Department of Labor reintroduced its fiduciary rule. A lot has happened since then and industry lawyers successfully swatted away the fiduciary rule. But its principles remain. DOL regulators introduced the idea of requiring advisors to put the client’s best interest ahead of their own. It is a concept that lives on in rules being considered by the SEC, several states and the National Association of Insurance Commissioners. At least one of those rules is scheduled to take effect in August 2019. Regulation 187 is New York’s answer to the court-ordered demise of the fiduciary rule. It applies best-interest principles to both annuities (effective August 2019) and life insurance (February 2020). 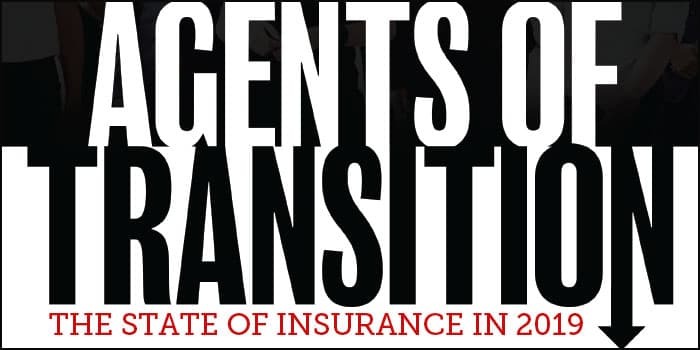 Two lawsuits seek to prevent Regulation 187 from taking effect — one by the National Association of Insurance and Financial Advisors’ New York chapter and another by Independent Insurance Agents & Brokers of America and the Professional Insurance Agents of New York. Several other states are pondering best -interest rules of their own, all while an NAIC working group struggles to produce a model law. Meeting throughout 2018, the working group continues to be unable to reach agreement on a few thorny issues. 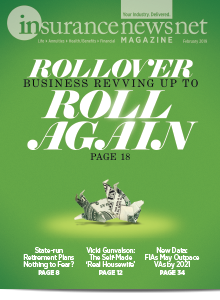 Progressive states such as New York are pushing tougher rules, while conservative, Midwestern insurance commissioners are opposed. The working group enters 2019 unsure of whether its work will continue. The industry obviously wants consistency, said Howard Mills, global insurance regulatory leader for Deloitte. Getting there in 2019 will not be easy. “I think this particular issue, the annuity suitability, is going to require a lot of debate and negotiation to get to a uniform standard and there’s no guarantee that they will get to a uniform standard,” he said. Critics say it does not go far enough. Many in the RIA community were disappointed with the proposal since it does not raise brokers to their tougher fiduciary standard. The SEC rules are certain to be a big topic in 2019. Meanwhile, the Democratic takeover of the House could lead to some welcomed legislation as the two sides seek out rare areas of agreement. One of those areas might be retirement security, with The Family Savings Act enjoying broad support. The bill includes a host of measures, including eliminating required distributions for retirement accounts totaling less than $50,000, encouraging employers to band together to form retirement plans, and creating tax-advantaged savings accounts that can be tapped immediately rather than waiting for retirement. It would also allow families to make penalty-free retirement plan withdrawals to help pay for childbirth or adoption expenses. Regulators are working on issues other than best-interest rules. In particular, data security remains a significant challenge. In 2017, the NAIC concluded years of work with the Insurance Data Security Model Law, which creates a legal framework for requiring insurance companies to operate cybersecurity programs. South Carolina became the first state to adopt the law in May 2018. Likewise, life insurance illustrations are generating headlines and requests to regulators — specifically, the role illustrations played in failing universal life insurance policies sold decades ago. The UL issue gained prominence when The Wall Street Journal published a September article that told the stories of several older Americans trapped by failing UL policies. Universal life policies offer a savings account in addition to the life insurance components. Money deposited into the savings portion earned interest to help pay future costs while keeping premiums down. Everything was all good until interest rates plummeted below 4 percent following the 2008 financial crisis. Many UL policies permitted customers to pay lower payments, or skip payments, and borrow against the savings account. The end result of this flawed concept is that policyholders in their 80s and 90s are facing steep premium bills. Their only alternative is to surrender a prime retirement plan asset and be left with nothing to show for years of paying premiums. 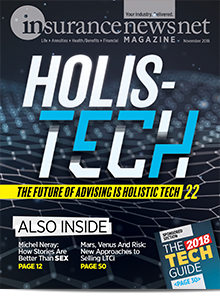 “Policies are either lapsing, or they are reaching maturity with far less value than anticipated,” said Richard M. Weber, a longtime financial advisor. 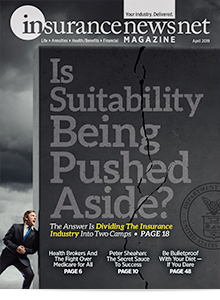 Weber is among several advocates, on both the industry and consumer sides, who want the NAIC to reopen the life insurance illustration model law. Doing so would undoubtedly set off a long and arduous process to adopt any changes. NAIC leadership did not respond to numerous attempts for comment. “My focus really is on credibility of an industry that has always implicitly had the trust of its customer base,” Weber said. “The credibility of a life insurance company is really, really important."